With the help of the NASA/ESA Hubble Space Telescope, astronomers have determined that 2002 LM60, an icy Kuiper belt object dubbed 'Quaoar', by its discoverers, is the largest body found in the solar system since the discovery of Pluto 72 years ago. Quaoar (pronounced kwa-whar) is about half the size of Pluto. 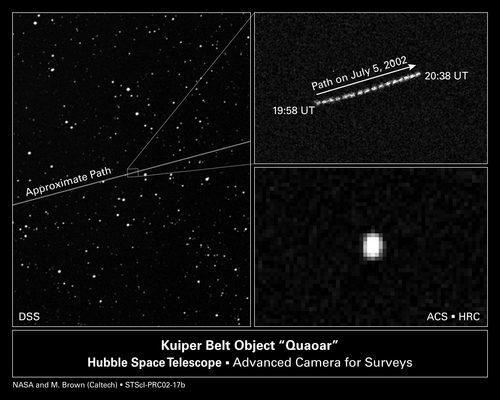 Like Pluto, Quaoar dwells in the Kuiper belt, an icy debris field of comet-like bodies extending 7 billion miles (more than 11 billion kilometres) beyond Neptune's orbit.